Holidays can be a challenge for parents who are trying to send healthy treats to school. Avoid the pre-packaged treats which can be high in fat, sugar and calories. Instead, find clever ways to serve fruits, veggies and whole grains for a satisfying snack. Halloween can be especially ghoulish with all the traditional sugar-filled options. 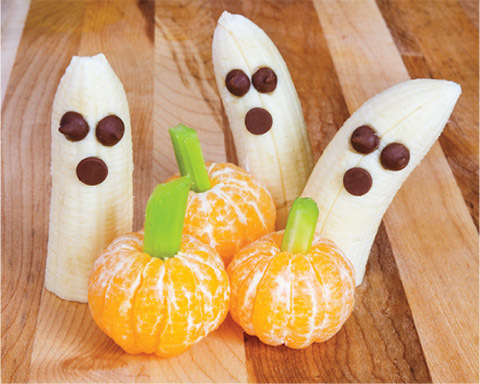 With the help of this spooky treat guide, it’s fun to make and enjoy low-sugar treats. Quarter and core an apple, cut a wedge from the skin side of each quarter, spread with peanut butter, then press slivered almonds in place for teeth. Baste the apples with orange juice to keep them from browning. Use sunflower or pumpkin seeds and sunflower seed butter for a nut-free option. Press three chocolate chips (two for the eyes, one for the mouth) into half of a peeled banana so that they resemble a ghost face. Layer small, clear cups with pineapple chunks, then Mandarin orange slices, and top with a swirl of whipped cream. For an even healthier option, swap low-fat vanilla yogurt for the whipped cream. Place something in each finger of a non-latex glove that resembles nails (raisins, candy corn, almonds), fill glove with popcorn, tie off the end, and accessorize with a plastic spider ring. Use Mandarins, clementines, or full size oranges. You can also use Mandarin orange or diced peach cups (in 100% juice) for little hands. 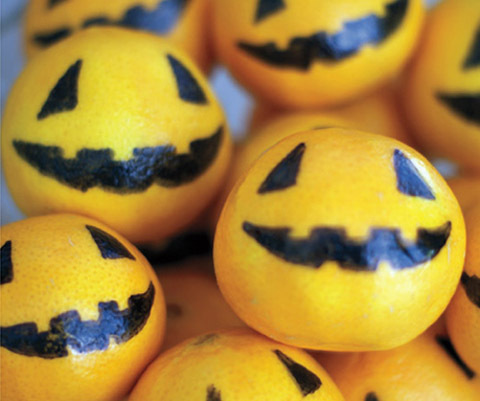 Draw a face with a black permanent marker (it won’t penetrate the skin so the fruit won’t be contaminated). It’s fun for children to see how scary or funny they can make the Jack-O’-Lantern’s faces. Thanksgiving and Christmas can be just as challenging for time-pressed parents. ’Tis the season for quick, sweet snacks made of fruit – with a twist!